Besides the Takarazuka Grand Theater and the Tokyo Takarazuka Theater, there are several other theaters that the Revue plays at regularly. These include the Umeda Arts Theater, Theater Drama City, Chunichi Theater, Nippon Seinenkan (Japanese Youth Hall), Nissay Theater, and the Hakataza Theater. Both theaters are located in Takarazuka, Hyogo. Access information can be found in English on the main website of the Takarazuka Revue here. Located in Tokyo. Again, access information can be found in English on the Revue's main website here. Both the main hall (formerly Umeda Koma Gekijou) and the Theater Drama City Hall are located in the same complex, in Osaka. Official Website here (Japanese only). -A 5 minute walk from Chayamachi exit at Umeda Station on the Hankyu Line. -Take the Midosuji South exit from JR Osaka station and it's an 8 minute walk. -There are several subway possibilities. The two closest are from the Midosuji Subway Line. 5 minutes from exit #1 at Umeda Station, or 4 minutes from exit #4 at Nakatsu Station. The Seinenkan is in Shinjuku, Tokyo. Official Website here. -Taking the JR Chuo-Sobu Line it is a 9 minute walk from either Sendagaya or Shinanomachi Stations. -Taking the Ginza Subway Line, it's a 7 minute walk from Gaienmae Station, exit #3. 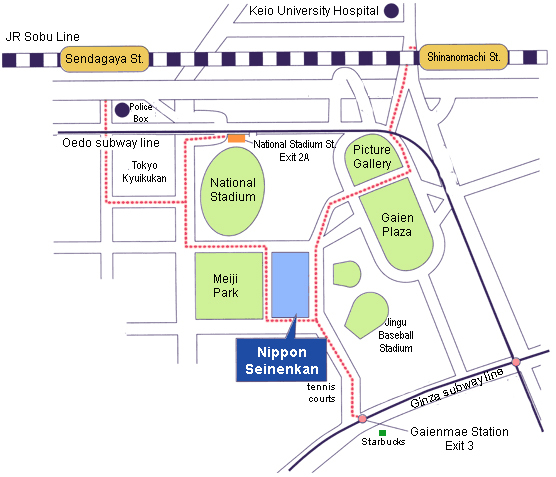 -Taking the Oedo Subway Line, it's a 7 minute walk from the National Stadium Station, exit #A2. The Chunichi Theater is located on the 9th floor of the Chunichi Building, in Nagoya. Official Website here. -By subway take either the Higashiyama Line or the Meijo Line to Sakae Station. From there it is a 3 minute walk to the Chunichi Building. The Nissay Theater is located in Tokyo, just around the corner from the Tokyo Takarazuka Theater. The Official Homepage has access directions in English here. Located in Fukuoka City. Official Website here. 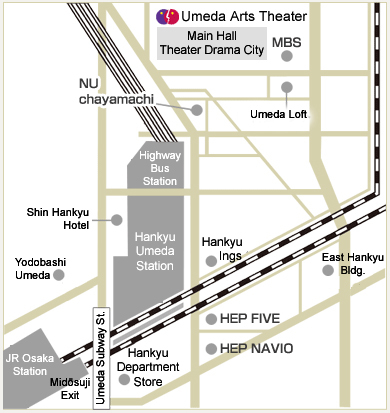 -The closest subway stop, Nakasu-Kawabata, exits right in front of the theater. Created by caithion. Last Modification: Monday 05 of February, 2018 12:49:50 PST by caithion.